The Fish Lake trail is one of the shorter, pleasant Glacier National Park Day Hikes. It is a spur trail off the Sperry Chalet trail. This trail begins climbing immediately as it passes through old growth of red cedar, western larch, and hemlock. As you ascend, the forest becomes dense with white pine and Douglas fir. I’m going to rate this trail as moderately easy as it’s all uphill on the way to the lake which makes it all downhill for your return trip. 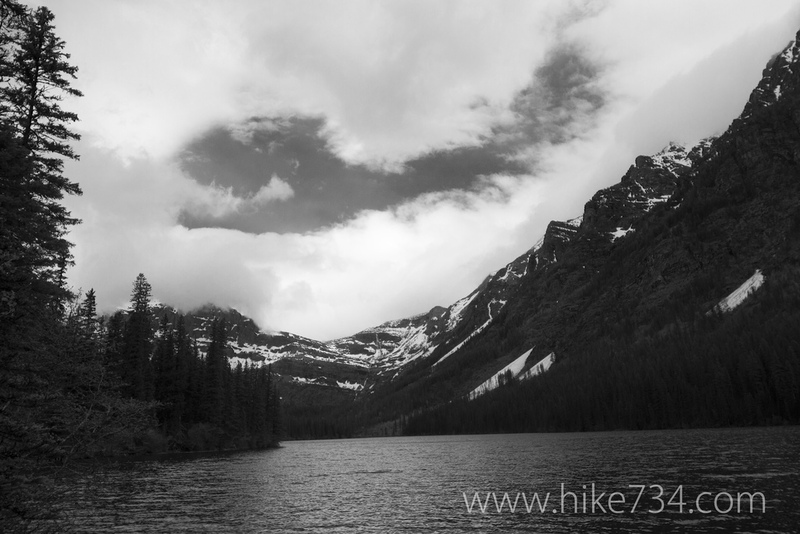 The Fish Lake Trail starts at the Sperry Chalet trailhead across the Going-To-The-Sun Road from Lake McDonald Lodge. It follows Snyder Creek climbing steadily for 2 miles until it crosses Snyder Creek. At the 1.7 mile point, the spur trail to Mount Brown takes off to the left. Another tenth of a mile up the trail, the spur trail for Snyder Lake will take off again to the left. From here you will descend slightly to the foot bridge across Snyder Creek and just after you cross Snyder Creek, the spur trail for Fish Lake takes off to the right. From this junction, the trail is relatively steep for a short distance before leveling off for the remainder of your hike. This portion of the trail passes through a beautiful spruce fir forest. You’ll cross over Jackson Creek and Sprague Creek before reaching Fish Lake. There’s a short side trail that leads down to the shoreline. The mosquitoes at Fish Lake can be quite thick during the late spring and early summer months so make sure you bring your mosquito repellent. 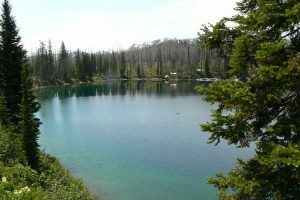 Fish Lake is an 8 acre lake lined with lily pads around it’s perimeter and nestled in a dense fir forested pocket in Snyder Ridge. There are no mountain views at this lake. Loons are a common sighting on Fish Lake and it is also very typical moose habitat. On the return trip, you will get some great views of Lake McDonald as you come down the shared portion of the trail. This hike is 5.8 miles long round trip. You will share the first 2 miles of this trail with hikers and horses heading to Sperry Chalet or other points of interest along this trail. But once you leave the shared portion of the trail, you will encounter very few people so sitting at Fish Lake makes for a very nice, quiet lunch spot – granted you have your mosquito repellent. Fish Lake is also a good early season hike as snow will be blocking access to trails in the higher elevations. To access the Fish Lake/Sperry Chalet trailhead, travel 10 miles along the Going-To-The-Sun Road once you have passed through the West Glacier Entrance to Glacier National Park. There will be a parking area on right hand side of the Road across from Lake McDonald Lodge. And remember, Glacier Park is bear country so don’t forget your bear spray. If you’re looking for a more challenging Glacier National Park Hike with minimal traffic, Numa Ridge Lookout trail will be the hike for you. The Lookout was built in 1934 and is still manned during the summer months. This trail is located in the North Fork region of Glacier Park. I’m rating it moderately difficult as the trail has an elevation gain of 2930 feet over 5.6 miles. Because this destination is a Lookout, you will get fabulous views of Bowman Lake, Mount Carter, Reuter Peak, Numa Peak, Square Peak, and Rainbow Peak as well as Akokala Lake, Moose Pond, and the Whitefish Range. The trail starts at the foot of Bowman Lake following the Bowman Lake trail. After hiking .7 miles along Bowman Lake, you will reach the junction with the Numa Ridge Lookout trail on your left. As you begin the Numa Ridge Lookout trail, you will start climbing immediately and continue climbing following switchbacks for about the next 5 miles. The Numa Ridge Lookout trail climbs up the southern slope of Numa Ridge through a dense forested area with lots of birds and wildflowers. You will pass Moose Pond on your right but there is not a clear path to it’s shores and difficult to see. As you gain elevation, the forest begins to thin and as you near the top you will start getting views of the surrounding peaks. Approaching the Lookout, you’ll be walking on limestone, the forest will be very thin, and you’ll get fabulous views of the surrounding mountain peaks and lakes. Be sure to enjoy the pikas and falcons that live in the higher elevations. This is bear country so keep an eye out for grizzly bears or black bears and be sure to take a bear spray. The Numa Ridge Lookout trail is 11.2 miles long round trip. The last 5 miles of this hike are all uphill and because it’s on the southern slope of Numa Ridge, you’ll be hiking in the heat of the sun so make sure you bring sunscreen. Also, there is no water at the Lookout so bring plenty of water with you. A water filter will not be helpful as there is no water source along the way. The good news is, the return trip is all downhill but be prepared to give you knees a break from the pounding of going downhill. To access this trail from Smoky Bear Ranch, turn right on the mostly gravel North Fork Road, or Route 486, to Polebridge where you will enter Glacier Park. Just after you enter Glacier Park, turn left and you will see the sign for Bowman Lake. The road into Bowman Lake is a two track dirt road so don’t be in a hurry. At Bowman Lake, you’ll find parking in the day use area which is where you’ll also access the start of the trail. The Logging Lake trail is one of the easier Glacier National Park Day Hikes. Logging Lake is a 4.5 mile long secluded lake that is seldom visited and provides a great way to connect with nature. 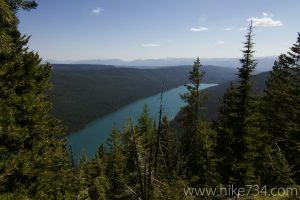 This hike is located in the North Fork region of Glacier Park. The trail follows Logging Creek to the foot of Logging Lake. You can continue on the trail along the northern edge of Logging Lake for another 7.8 miles to Grace Lake but this will turn it into an overnight trip. With an elevation gain of 477 feet, it’s an easy hike through densely forested terrain and forest fire burn areas. The start of the trail is a short climb to the top of a densely conifer forested plateau with a variety of wildflowers and wild-berries. It then follows along the rim of a shallow canyon created by Logging Creek. After about a mile, you will enter the burn area of the 2001 Moose Fire and other smaller burn areas dating back to the Howling Fire of 1994. In the burn areas, there are many standing burned tree trunks which create a food source of bugs and grubs for the woodpeckers, flickers, chickadees and nuthatches. Stop and listen for one of these birds tapping on a tree trunk and see if you can find it. Take advantage of the views you get while in the burn areas because after about 1½ miles you’ll reenter the mature forest. This portion of the trail can be wet, muddy, and buggy so don’t forget your mosquito repellent. At the 4.9 mile point, you’ll reach the unmarked junction with the Logging Patrol Cabin. After another tenth of a mile, you’ll see the spur trail for the Lower Logging Lake Campground on your left which will take you down to the lake shore. As you stand on the shore of the beautiful blue Logging Lake, you’ll get great views of Mount Geduhn and Anaconda Mountain rising up from the head of Logging Lake. To access this trail from Smoky Bear Ranch, turn right on the mostly gravel North Fork Road, or Route 486, to Polebridge where you will enter Glacier Park. Just after you enter Glacier Park, turn right onto Glacier Route 7 and travel about 7 miles to the Logging Creek Campground. The trailhead is located about 100 yards north of the campground. This is an 8.8 mile long round trip hike to the foot of Logging Lake. This is bear country so keep an eye out for grizzly bears or black bears and be sure to take a bear spray. For information on some of our other favorite day hikes see our posts Glacier National Park Day Hikes (Long Hikes) and Glacier National Park Day Hike (Short Hikes).